It was feeling too quiet here in Australia about a ban on plastic bags, so I dusted off the seashells and we held a rally in our paradisal ocean town of Byron Bay. 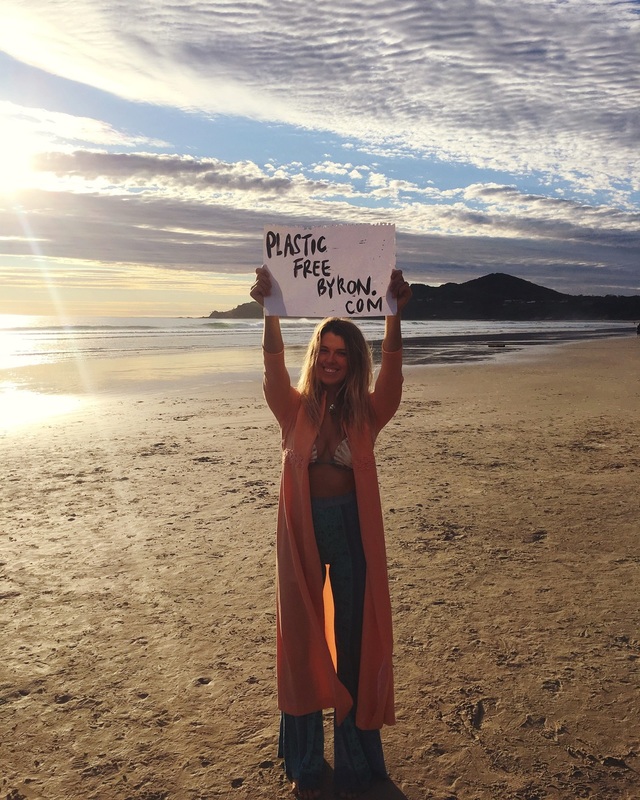 Byron locals are encouraged to register for Plastic Free July at plasticfreebyron.com for events, discounts, good vibes! It’s been a year since we walked into Parliament with 12,500+ signatures requesting a ban on plastic bags. On 29 February 2016 the Minister of the Environment held a Ministerial Roundtable where this issue was discussed. Fortunately, a ban will happen; there is pressure from the Greens, Labor, and federal Environment Minister Greg Hunt for NSW (and QLD and VIC) to take action on this important issue. Unfortunately, the government website for this issue hasn’t been updated since 26 February 2016. Great, it will happen—but with dolphins, whales, and turtles dying—what is the freaking hold up? Australians use over 10 million plastic bags a day. Polls suggest a majority of NSW consumers support a ban. It is offensive to put this issue off to the side while these single-use items that never biodegrade are used in such extreme quantities on the regular. Instead, we beg the government to maintain the momentum of the Cash for Containers win and ban single-use plastic bags in the same breath. We gathered at sunrise. It was absolutely stunning with pink clouds lighting up the sky, silhouetting the lighthouse. Whales were breaching in the distance. The vibe was high. People were stoked to be a part of something positive. Gathering to support legislation that will prevent pollution, prevent draining a non-renewable resource, prevent threats to wildlife, and significantly reduce our dependence on single-use plastics. More than 1 million birds and hundreds of thousands of marine mammals die every year due to disposable plastics. This was just 100 humans gathered on a beach, laying on the sand with plastic bags over our heads as if we too are victims of the collective addiction to single-use convenience. We sent these images with a plea for action—or at least an update—to all the media we could think of, to all 8 Directors of the EPA, to Mark Speakman (Minister of the Environment for NSW), to the Greens, to Labor, to the EPA and governments of states and territories who have bans in place to help us pressure our own state. The fact people were gathering on a beach seemed to be more newsworthy than the issue we were gathering about. We got more press before the event than after. All emails to government received automatic replies—except for Greens MP for Ballina, Tamara Smith. She commended us for our efforts and agreed to meet with the seashell clad activists to chat strategy for re-igniting this issue. We will continue pushing for the bag ban by hassling the government with emails and phone calls. If the ban does not include biodegradable bags, then Speakman was clearly using that claim as a stall tactic while millions of bags were used in his state inevitably polluting the environment and killing creatures. In which case, the seashells will come back out. Or maybe the spiky, aggressive sea urchins. Can someone get mer-Richard on the shell phone, please? Many third world countries have had bans on plastic bags for years. Most took action quickly on this issue because they could not afford the waste management. China has had a ban on plastic bags since 2008! Many countries in Africa, Asia, Americas, and EU have banned, taxed, or charged for plastic bags and seen an incredible reduction of waste simultaneous with quick adoption and support from consumers. Australia is a wealthy nation and has been able to afford to let our waste be someone else’s problem or responsibility. It is time to take responsibility for our waste, which means reducing our use of disposable plastics. The momentum is considerable in NSW and in many communities to ban single-use plastic shopping bags. South Australia, the Northern Territory, Tasmania and the A.C.T. have already taken the step – with great outcomes for the environment. The South Australian ban came into effect on 4 May 2009. The initiative saw a 45 % reduction in plastic waste in the state. Since then the Northern Territory, Tasmania and the ACT have all moved to put bans in place. Currently Victoria, New South Wales, Queensland and WA have no restrictions on disposable bags. The states claim committed to the issue, but not ready to act. ■ Minimise the number of plastic bags entering waterways and the marine environment and reduce harm to marine animals. ■ Reduce consumption of plastic products. ■ Encourage more sustainable packaging solutions using reusable and biodegradable alternatives to plastic. ■ Support the community’s aspiration for improving environmental sustainability. ■ Reduce the visual impacts of plastic bag litter. The Greens Plastic Shopping Bags Ban Bill is modelled on current legislation in South Australia and Tasmania, banning polyethylene shopping bags with a thickness of less than 35 microns from being handed out or sold by retailers to carry away goods. This includes lightweight single-use plastic bags such as grocery bags with handles and other lightweight bags used to carry away products from retailers such as take away food or alcohol. But does not include Barrier bags – such as the type dispensed from a roll to hold items such as loose fruit and vegetables, Heavier style retail bags – the type usually used by clothing and department stores, Sturdy bags designed for multiple use such as ‘green’ bags, Biodegradable compostable bags that meet the Australian Standard 4736-2006, Paper bags, Bin liners for purchase, Zip lock storage bags, Plastic bags that are an integral part of the packaging (such as bread, frozen foods, ice bags or bait bags), Re-usable plastic bags. A penalty regime for retailers found to be providing or selling plastic bags to a customer for the purpose of carrying goods is proposed to be in-line with other jurisdictions, which are between $5000 and $7000. The scheme would be administered by the Department of Environment and Heritage with enforcement being the responsibility of the Environmental Protection Authority.